A reliable beer dispenser is a must-have for any pub or bar. Beverage-Air offers a great selection of beer dispensers in a variety of sizes, all tested to operate in an ambient environment of up to 100 degrees Fahrenheit. Whether you’re looking for a compact unit or an oversized unit, this product line has something to meet your needs. Standard 28” deep and shallow 23” deep units are also available to best suit your space. Plus, on select models, the front-breathing compressor can be installed on either side; just specify which side at the time of purchase. Dispensers are available with either a black or stainless steel exterior and all feature a galvanized interior with a stainless steel floor. Standard units are built with a stainless steel top, though underbar models are available, as well. Available in either solid or glass, the doors are all outfitted with snap-in gaskets that are easy to replace and feature locks for security during off-hours. They’re also self-closing and field-reversible, with the added bonus of a 90 degree stay-open feature. A stainless steel drip tray is built-in beneath each dispensing tower, which are fully insulated. The units are easy to operate too, with a full electronic control and provided manifolds for immediate use. This series of beer dispensers uses environmentally-friendly R290 refrigerant, which has an ozone depletion potential of 0 and a global warming potential of 3. 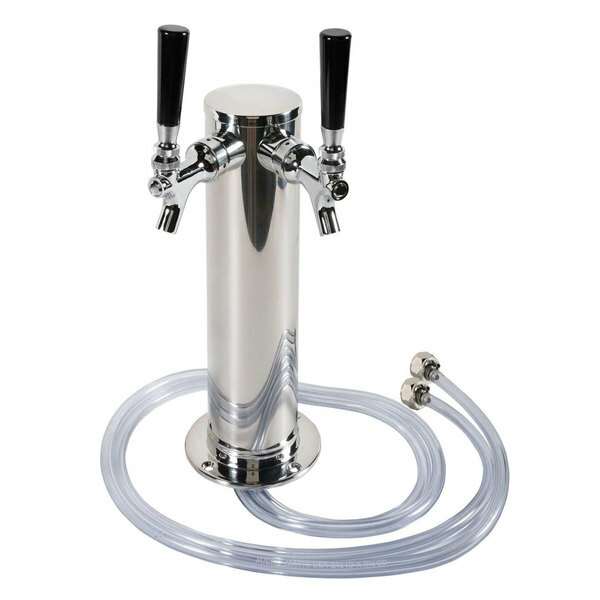 Beverage-Air beer dispensers are backed by a generous 3 year warranty and are proudly made in the USA. 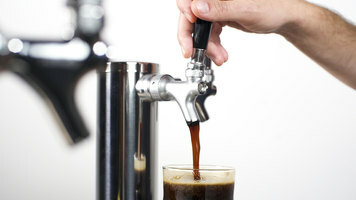 Learn all of the ins and outs of Beverage-Air's great selection of Beer Dispensers! Quickly and easily dispense your most popular wines straight from your bar or kegerator with the Beverage Air 406-061A wine tap tower! This item features a widely popular 3" diameter column and two taps so you can serve your customers their most desired wines in no time. It also has a 9 1/4" faucet height to accommodate a variety of glasses.